Sarah Cooks: Happy Birthday Georgina!!! My friend Georgina is a very cool, trendy young lady and her quarter-century birthday celebrations were no different. 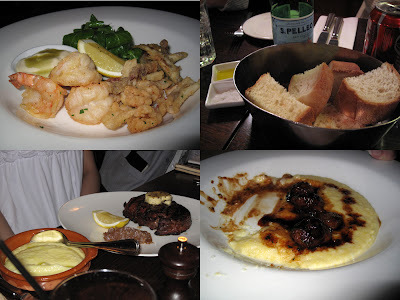 We started of with dinner at Scarpetta's on Brunswick st, followed by copious cocktails at Black Pearl. I hadn't been to Scarpetta's before, but I really liked their dim lighting and arty pictures. (It actually is a lot cooler than the website led me to believe, haha). It's quite a narrow restaurant, with the bar on the right side, and one row of tables along the left. 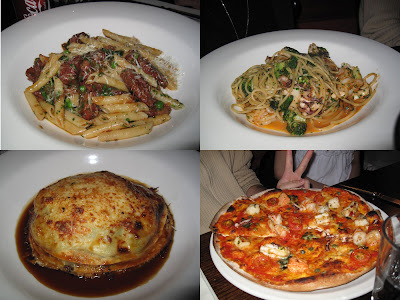 The food is modern Italian, and they have a great range of well priced pizze (all under $18). Other main dishes are a bit pricey - around $25-32. I can't remember the exact prices, and the menu has changed from what's currently on their website - apologies if I made any mistakes! Top Left: Pennette pasta with beef ragu and peas. It had a deep mushroomy taste - perhaps porcini or truffle oil? I thought Scarpetta's was a great find. Even though we had a big table, our food all came out quite quickly and without fuss. The small space and dim lighting would make it a great place to take a date. And even though it was a little pricey, the food was all delicious. Any place that can make a version of polenta I like gets my vote! And here are my little square mud-cakelets! They survived the trip admirably and were swiftly demolished. Blog post about Black Pearl cocktails coming up! Nice review! Thank you Sarah for posting with nice pics as there are very few blog entries around on Scarpettas. I am looking forward to dining there this weekend.